You should check your Refrigerator model number to make sure this fits. SAME GREAT QUALITY AT A FRACTION OF THE PRICE – Experience the same quality of filtration without any sacrifice to the water flow rate. 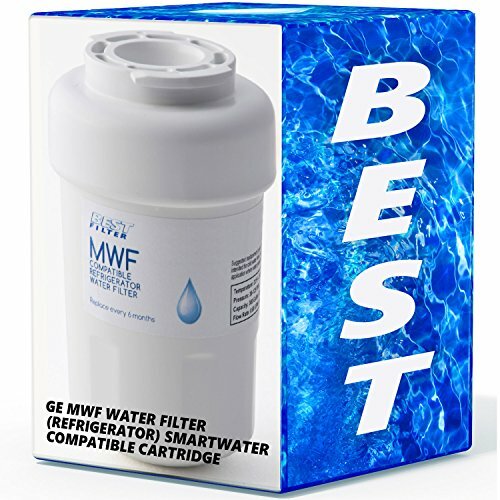 Best Filters GE MWF Water Filter is also nearly half the cost as the manufacturer’s primary filter. CHANGE YOUR FILTER EVERY 6 MONTHS – For optimum performance it’s recommended you change your filter every 6 months. Included with your purchase is a set of reminder stickers to help alert you when it’s time to change. 100% LIFETIME MONEYBACK GUARANTEE FROM THE MANUFACTURER – If you’re ever unsatisfied with any of Best’s replacement water filter, they’ll give you a full refund! It’s important to change your filters as recommended to ensure you have the filtered water your home and family need. GE replacement filters make changing filters easy. For example, you’ll never have to worry whether you’ve installed the filter upside-down—their filters can be installed in either direction.